Here are links to case-study descriptions of two MOOCs. They are both informative, interesting descriptions of the projects, students and outcomes. For example, one thing that caught my eye was the fact that a significant number of participants in both classes were motivated by personal curiosity. (You will have to read them to see what catches your eye :-). IEEE Spectrum Podcast interview of Professor Roger Barr, who taught the Bioelectricity course (13m 42s). 3. Katy Jordan has compiled MOOC completion rate and assessment type data and displayed it in an interactive graph. 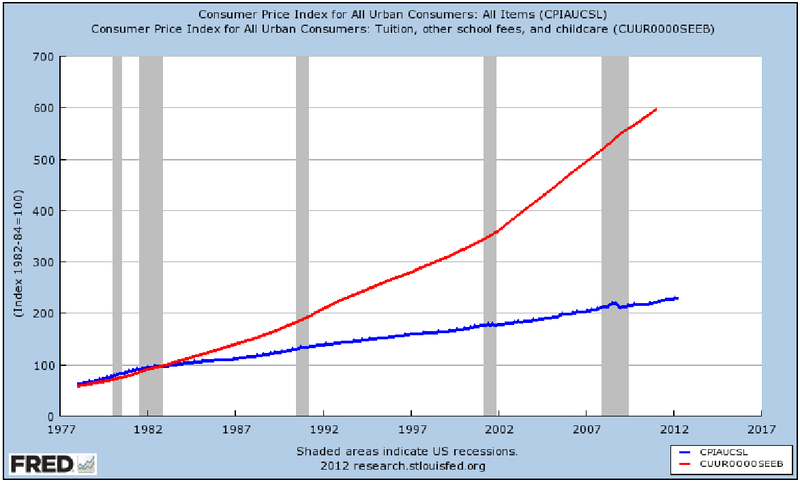 (Be sure to visit the interactive graph -- you can filter it in several ways). A lot of people, myself included, are upset at Google's decision to eliminate their RSS reader, Google Reader. Perhaps Charles Arthur was one of them, because he has just written an article reporting the lifespan of 39 canceled Google services and application programming interfaces (APIs). 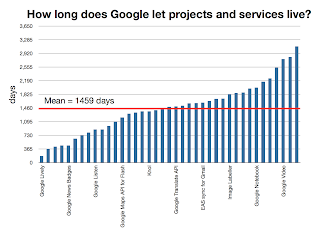 It turns out that the mean life span of canceled projects is 1,459 days, just under four years. The article has a table listing the start and end dates of the 39 services and APIs. I use Google Reader in my work and, until now, have been having my students use it. We use other Google services even more -- Google Docs, Blogger, Google Plus and Hangouts are central to my teaching and other work. I would be happy to pay a reasonable fee to use those services, but would think twice about requiring my students to do so. 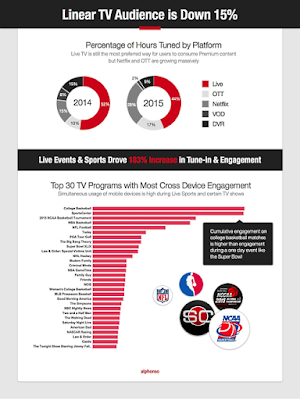 IP TV is taking off -- which organizations will run the next global "networks?" I recently wrote a post on Netflix's made-for the Internet series, House of Cards, saying that I did not like it as much as the HBO series The Sopranos. I've since finished watching House of Cards, and, even if I did not find it as compelling as The Sopranos, I was hooked and enjoyed watching it. I ended that review by saying I hoped House of Cards would succeed and Netflix would give us more high production value entertainment online. It did succeed -- as you see here, it has an average rating of 4.6 stars. In retrospect, that is not such a surprise. 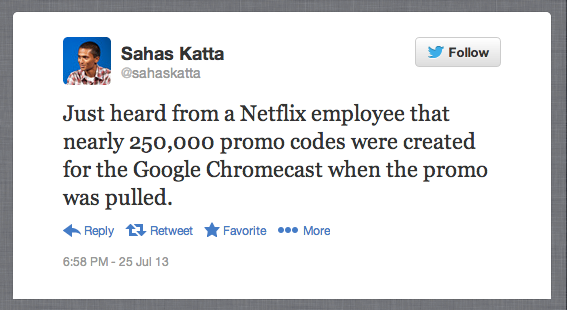 As David Carr points out, Netflix's use of big data pretty well guaranteed them a hit. Before starting production of the series, they knew that people liked the movies of director David Fletcher and star Kevin Spacey as well as the British version of House of Cards, upon which this series was based. Given that history, they were confident the series would be a success, so they produced 13 episodes without a pilot test. As you see here, the episodes vary in length from 46 to 56 minutes -- the writers were freed from the constraint of broadcast television episodes, which must fit into time slots. Having 13 episodes recorded ahead of time, meant that viewers, including me, could watch two or more together. We were freed from the weekly release schedule of broadcast television. The season constraint is also gone -- it could have been 12 episodes or 14 -- whatever the writers felt worked well. 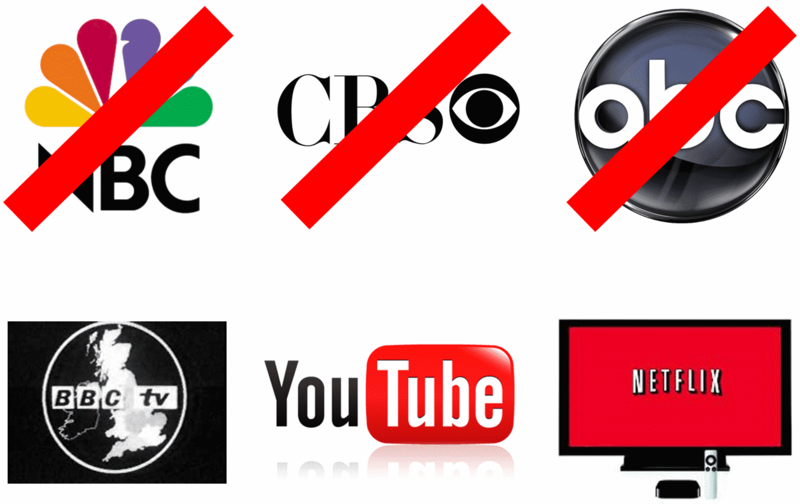 We were also freed from commercials, which I really hate now after a year or two as a cord cutter. They could have also dropped the episode constraint. 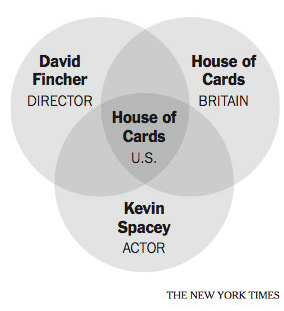 One can think of House of Cards as a 661-minute movie. A viewer could pause whenever he or she felt like it and resume later or the writers could have inserted suggested pause points. I am not sure how well that would work out for viewers or how the writers would have handled the 11-hour format, but it would have had one positive advantage -- the viewer would not have to watch the series introduction and credits 13 times. 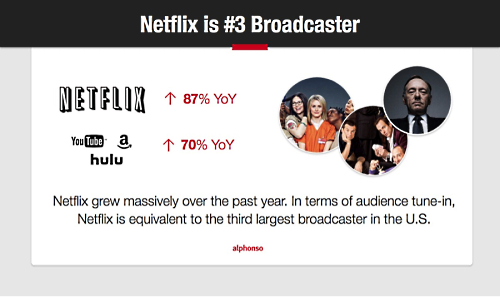 Netflix has committed to more Internet production, and they are not alone. YouTube is bankrolling productions and their audience exceeds 1 billion views per month. The BBC has announced plans to produce Internet programs, and they are experienced content producers. Netflix jumped out to an early lead, but the BBC commitment reminds us that the Internet is global and we will see global productions as well as global audiences. The times they are a'changing. The situation is well summarized in a quote by Netflix's chief content officer Ted Sarandos, who said "The goal is to become HBO faster than HBO can become us." Will Netflix, YouTube, the BBC and others become HBO-like content producers before HBO is freed of contractual obligations and moves their content to the Internet? Historians look back at movies like Birth of a Nation, with its use of panorama shots, panning, night photography, a musical score and a large battle scene, or The Jazz Singer, with its sound track, as production technique breakthroughs. 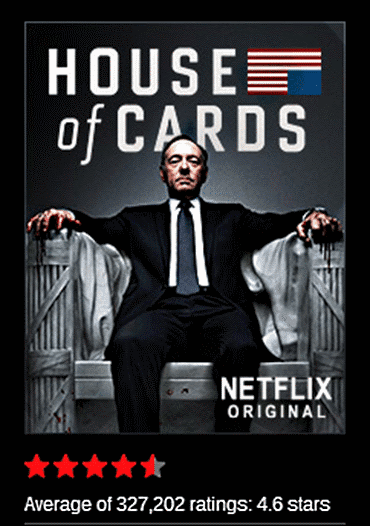 We may one day look back on House of Cards as a distribution breakthrough. Amazon has committed to production of five children's programs in addition to six comedies they announced earlier. Netflix is not standing pat -- they announced an 8-episode series to be called, Sense8, by the creators of the Matrix movies and Babylon 5. As with House of Cards, they are betting on a near-sure thing. Even Twitter wants in on the video goldrush. Next week, Comedy Central will host a comedy festival on Twitter. That sounds like a long shot, but I love comedy, so will give it a shot. The hashtag is #ComedyFest. Amazon has debuted pilots of their initial productions (http://indy.st/11doxAs). 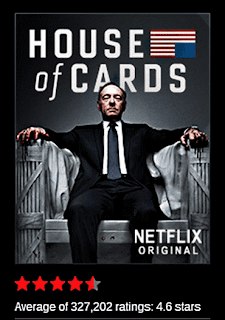 Netflix accurately predicted the success of House of Cards using past history and was confident in producing 13 episodes at one time. Amazon will use the public as a very large "focus group" in deciding which shows to produce and which to drop. Netflix has released its second complete series, Hemlock Grove (http://nflx.it/14HdTIg). It has a four star rating -- Netflix mitigates their risk by mining their Big Data before producing the episodes. Netflix and Amazon have an advantage over traditional producers in their ability to predict the likely success of new productions. House of Cards was nominated for best drama for the 65th Primetime Emmy Awards. The series earned nine nominations overall, including lead acting nods for Kevin Spacey and Robin Wright. Netflix profit grows but stock dropped because the number of subscribers was disappointing. 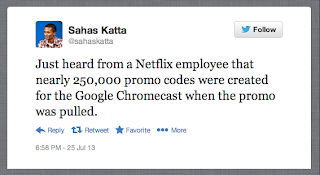 Subsequently, they got a big boost in trials when Google bundled a 3-month subscription in with their new Chromecast device. HBO is offering access to seven series in the Google Play store. They cost between $2 - $3 per episode and $19 - $29 for a full season. They say more will come. Netflix said they wanted to become HBO before HBO became Netflix -- the race is on. (This looks good for Google too). You no longer have to be an HBO subscriber to see HBO programs -- you can order individual episodes or full seasons ala carte from Google. (Individual episodes cost between $1.99 and $3.99 and full seasons are between $14.99 and $38.99, depending upon the show and the video quality.) The selection is limited today, but HBO says they will add more -- this must be a delicate marketing and contractual issue with their cable and satellite carriers. Bloomberg projects that Netflix is poised to pass HBO in paid subscribers and is in talks about offering their content through cable providers like Cox Communications. Consumer choice is growing and we are seeing more and more content on the Internet, but, will we settle into the usual ologopoly pricing situation? Today, we notice some pricing differences and some similarities. HBO charges for episodes or seasons. Amazon offers current season releases for $1.99 (or $2.99 for HD). Amazon offers their Prime customers a lot of free content, but it is limited. A Prime subscription costs $79 per year, but it also includes fast shipping on things you purchase from Amazon. Netflix offers all you can stream for $7.99 a month, but its streaming service is limited -- for example they offer movies on DVD that are not available for streaming. Amazon and HBO charge an additional dollar per episode for high definition video, and my guess is that is a lot more than the extra bandwidth cost and that difference will drop as bandwidth becomes cheaper. It will be interesting to see if they keep that differential. (That may seem like gouging, but it is nothing like the phone company pricing for text messages). It would be cool if you could get any content from any "channel" and they were all competing on price, but with a relatively limited number of channels and production companies, I expect the market will eventually settle into a comfortable oligopoly/oligopsony. Netflix introduces a new user interface -- it shows how their recommendation algorithm came up with suggestions for you. Netflix and YouTube combine for over 50% of North American traffic. HBO Go shows up as a supported Chromecast app in the Google Support page. HBO CEO Richard Plepler announced that the pay-TV channel would launch a stand-alone, online streaming version of its service next year. This move was predicted by Netflix's chief content officer Ted Sarandos, who, nearly two years ago, said "The goal is to become HBO faster than HBO can become us." This will make cord cutters happy, but, Plepler made the announcement at a Time Warner Cable meeting. As long as ISPs maintain their monopoly/oligopoly market positions, they will be able to raise their Internet service prices as consumers shift away from bundles of TV channels toward Internet streaming. Linear TV viewing is down 15% over last year and Netflix is the number three broadcaster in the US. My first reaction -- wow that is cool -- I like global visualizations of the world and the Internet -- check out the hot spots in Silicon Valley, Southern California, back east and in Asia. Look at India and China. My second reaction -- aren't botnets evil? Not this one. Follow the link above and you will find a full description of this ethical, benign botnet. It gathered interesting information and did no harm. 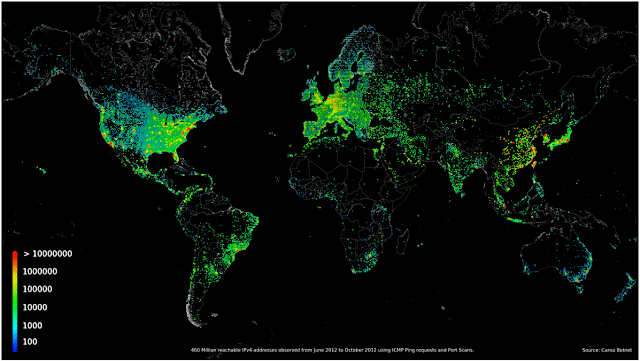 This map is only one Carna botnet result. 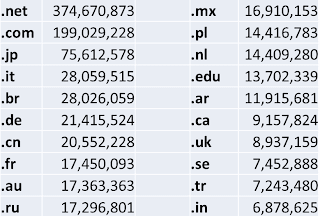 For example it found 141 Million firewalled IP addresses and 729 million more with reverse DNS records for a total of 1.3 Billion used IP addresses. You can see all that and more in the Carna paper, and all the data is available for download. The author does not identify him/herself for reasons of modesty and perhaps fear of upsetting people, but, whoever you are, thanks for your effort and it would be great if you would it on a regular basis. Google chose Kansas City for its first gigabit fiber network, and they just picked the second city, nearby Olathe, Kansas. 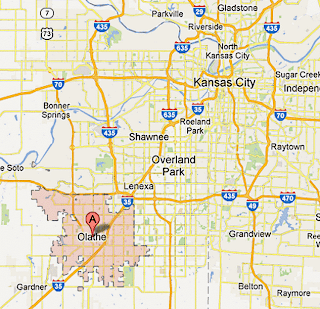 Google skipped over Kansas City suburbs like Prairie Village, Mission, Shawnee and Overland Park to bring their gigabit fiber to Olathe, a separate city with 125,000 residents. 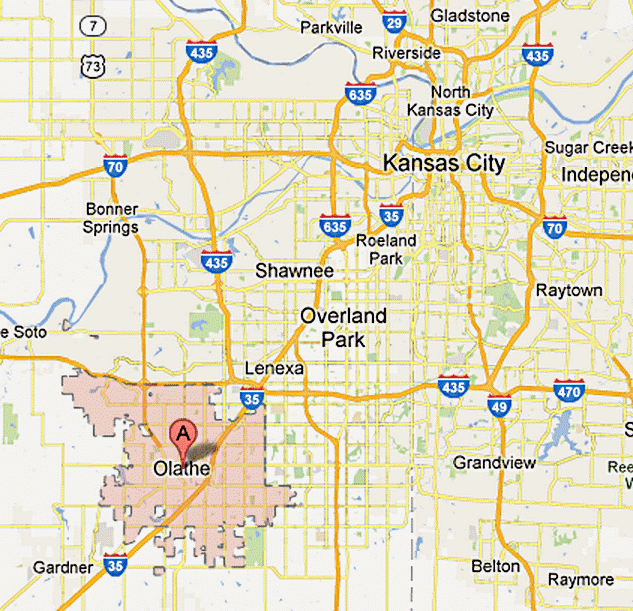 I lived in Prairie Village while in high school, and at the time, Olathe was way out in the sticks. Times have changed. Does this portend more Google Fiber cities? Are they just trying to make a point to get the incumbent cable companies off the dime? Time will tell. As rumored for some time, Google has announced that they will extend Google Fiber to Austin Texas. Austin is about the same size as Kansas City and it a hi-tech hotbed. 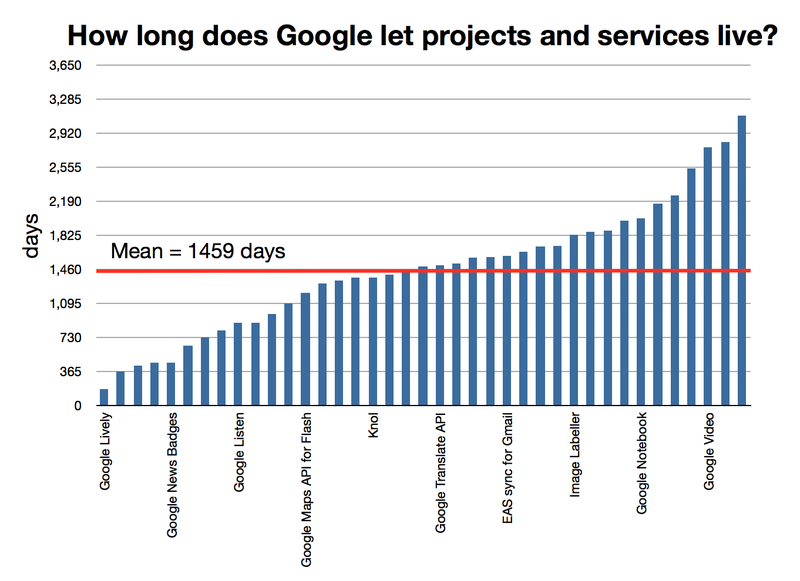 Google will gain insight into future applications of high speed networks and it will not cost them much. In the wake of the Austin rumors, we also saw speculation on the cost of the Kansas City networks and of a nationwide buildout. Eric Schmidt has been quoted as saying that gigabit Internet is a real business. Maybe they will focus on somewhat small, hi-tech cities?? 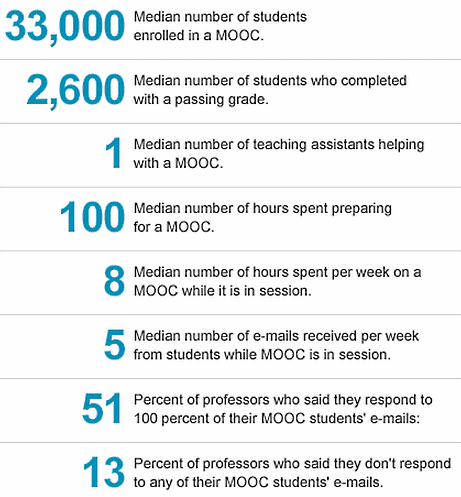 The Chronicle of Higher Education has published the results of a non-scientific survey of professors who have taught a MOOC. The online questionnaire was sent to 184 professors in late February, and 103 of them responded. My favorite result was the answer to the question "Has the experience of teaching a MOOC inspired you to change the way you teach the traditional classroom version of the course" -- 73.7 percent of the respondents answered "yes." Even if MOOCs are a flash in the pan, they trigger innovation in pedagogy, technology and certification, just as online teaching material will take us beyond the traditional textbook. I was also struck by the completion rate. The median number enrolled was 33,000 and the median number who completed the course with a passing grade was 2,600. This was achieved by a median of 1 teaching assistant and 8 hours per week of the professor's time. 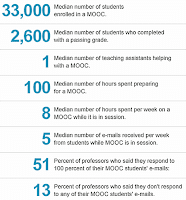 In a recent blog post, I asked whether a MOOC with 700 active students was a bad deal. If we can teach 2,600 students, we can justify a full time professor and production costs -- what could you accomplish if you worked full time on teaching one class and had good support? Check the Chronicle article to see the rest of the results, and be sure to note that there are three tabs at the top of the page -- an article, the survey results and quotes from eight of the professors. The California legislature may endorse credit for MOOCs. Governor Brown is following in his father's footsteps. Governor Pat Brown is remembered for developing the California master plan for higher education in 1960. His son, Jerry Brown, the current Governor of California, may be remembered (for better or worse) as an Internet-era reformer of higher education. Last fall, Governor Brown signed a bill designed to generate open text books, in order to alleviate the rapid rise of textbook prices compared with consumer prices, shown below. (Click images to enlarge). This spring, San Jose State University is running a trial offering of credit for massive online courses from Udacity, a private company. The hope is that this will reverse the rising cost of tuition and fees. Now the California legislature is considering a bill requiring the state’s public colleges and universities to give credit for faculty-approved online courses taken by students unable to register for oversubscribed classes on campus. With respect to higher education, cost pressures are relentless and many students cannot get the classes they need. A half million fewer students this year enrolled in the community colleges than in 2008. Graduation in four years is the exception and transition from one segment to the other is difficult. The University of California, the Cal State system and the community colleges are all working on this. The key here is thoughtful change, working with the faculty and the college presidents. But tuition increases are not the answer. I will not let the students become the default financiers of our colleges and universities. The president will call on Congress to consider value, affordability, and student outcomes in making determinations about which colleges and universities receive access to federal student aid, either by incorporating measures of value and affordability into the existing accreditation system; or by establishing a new, alternative system of accreditation that would provide pathways for higher-education models and colleges to receive federal student aid based on performance and results. If you want to dig deeper, you can see the text of the ambitious bill introduced February 21 and some March 8 amendments. The California State Senate unanimously passed Senate Bill 520, authorizing the granting of credit for courses taken online. The bill now goes to the Assembly. California puts SB 520 on ice. State Senator Darrell Steinberg, who introduced the bill, has put it on hold in the face of faculty opposition and to take time to evaluate new online programs proposed by the University of California, California State University and California Community College system. For example, the California State University will offer 35 online courses statewide. Google Glass -- why just capture reality when you can mediate and improve it? There is a lot of hype surrounding wearable computing these days and Google Glass gets a lot of that attention with demonstrations of video and image capture and augmented reality, as shown in this video, which has been viewed over 16 million times. 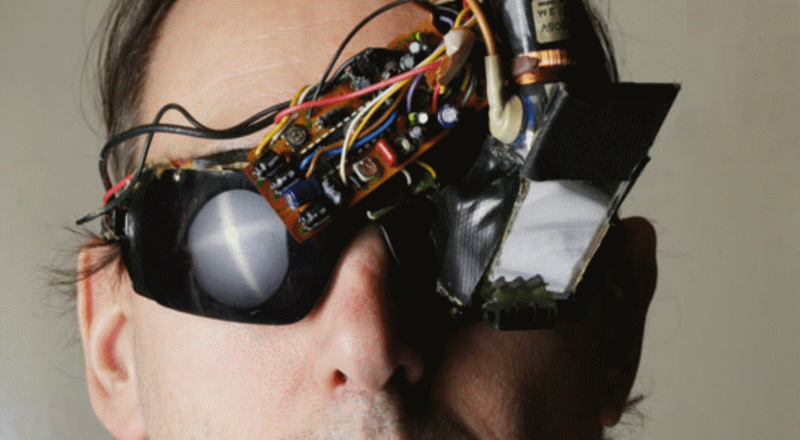 But University of Toronto professor Steve Mann has been wearing electronic glasses and working with mediated reality for over 30 years. 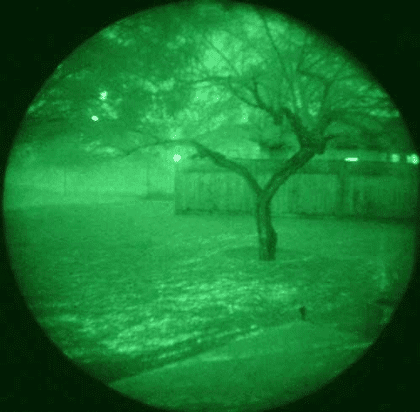 Mann differentiates between "augmented reality," where text or graphics are displayed over your normal vision and more general "mediated reality," in which vision is improved -- for example, detecting infrared radiation to see temperature differences, zooming in on distant objects, or extending the dynamic range of a photographic image by combining various exposures. He discussed these applications and more in an recent Techwise Conversations podcast interview. Mann has pioneered mediated reality, but he is not alone in the field. For example, professor Gabby Sarusi and his colleagues at the at Ben Gurion University of the Negev are working on a nano layer coating for detecting infrared radiation in night vision goggles. Work on high dynamic range photography has also been with us for some time. Journalists are beginning to report on initial experience with Google Glass prototypes and Google is fishing around for a killer app, but I suspect that Google Glass will turn out to be a niche product. We will not be wearing them 24-7, but some of us may put them on for special tasks -- like a surgeon entering the operating room. That being said, research prototypes and high-value niche applications have a way of turning into ubiquitous, game-changing products, but it takes a while -- as you see in this photograph of Ivan Sutherland, inventor Sketchpad, the first object oriented computer graphics program, which he developed more than twenty years before MacDraw came out. 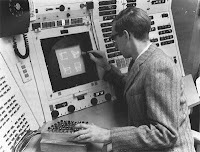 (Ditto, any early prototype). What about fifty years from now? Will Google Glass 2063 interface directly with the retina? What if online classes and MOOCs really do take over the world? Will that exacerbate the "digital divide?" Will poor and rural US students have to seek out public libraries and other public access spots? An article in the Chronicle of Higher Education focuses on that question. What about students in developing nations? Good luck taking a Coursera course in, say, Myanmar or Cuba. In much of the world, Internet access is too expensive for the average person and, even if they can get online, too slow to effectively use a modern Web site. As online courses increase in sophistication, bandwidth will become an even greater impediment to participation. 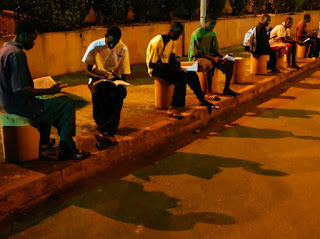 The Guinean students shown here are studying under street lights (click to enlarge). Will they have access to global online education? 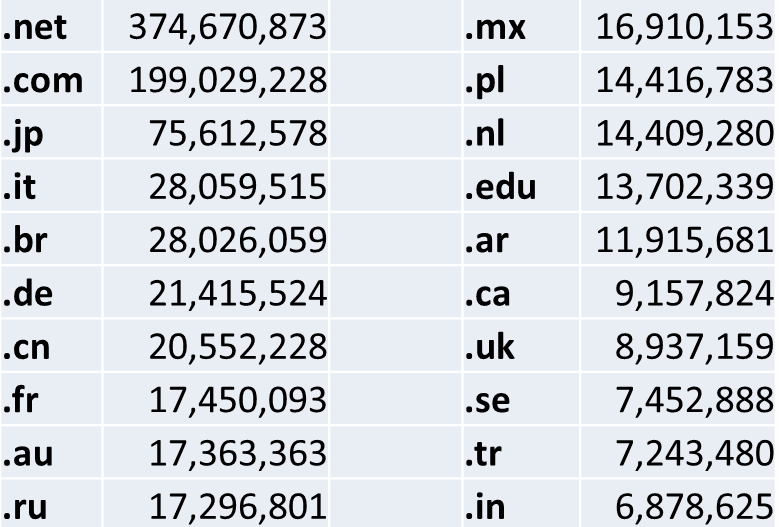 A followup article talks about the impact of data caps for online students in the US. Again, the situation is much worse in developing nations. A University of Pennsylvania study of a million users who signed up for one of 17 courses they offered through Coursera showed that few were from developing nations. The Chronicle of Higher Education and NPR Marketplace have reported results of a survey they commissioned of employers of college graduates. They found that where a student goes to school is not as important as you might think. Graduates of "flagship" state universities are only seen as a little more "preferable" (on a 5-level Likert scale) than private or regional public campuses. 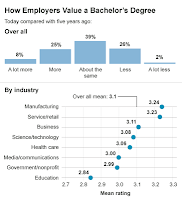 They also reported that, with the exception of education majors, the perceived value of a bachelor's degree was somewhat lower than it was five years ago. 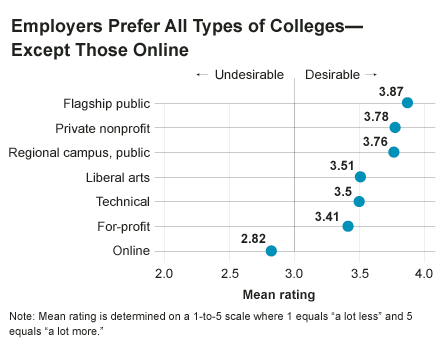 Online degrees were rated "undesirable" (2.84 on a 5-level Likert scale), but I suspect that is based online private schools like the University of Phoenix. 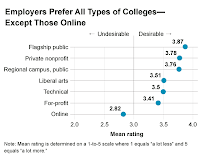 Universities are moving increasing numbers of their classes online and that trend is stronger in public than private schools Will employer's perception of their graduates decline? What of fully online public programs like Calstate Online? For me, the most interesting result was that internships were rated as more important than where one went to college, their major or GPA. Completing an internship was reported to be the most important credential for recent college graduates. 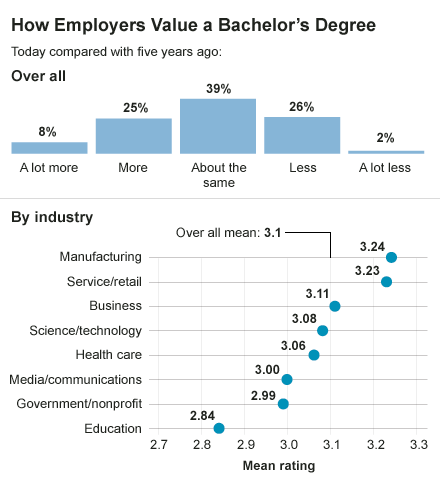 A related survey of 2012 college graduates reinforces the value of internships. 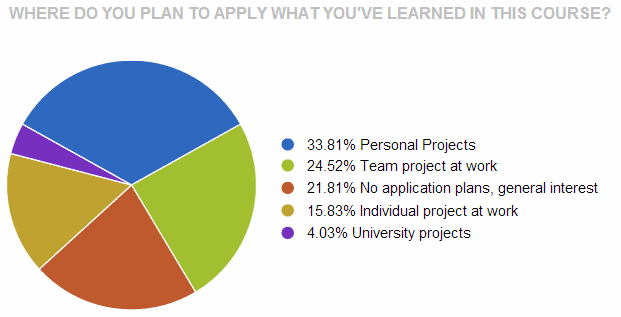 They found that 55% of the students had internship and/or co-op experience and 51% of interns were offered jobs. 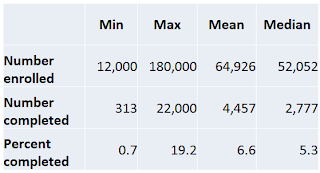 Payed interns fared better than volunteers. 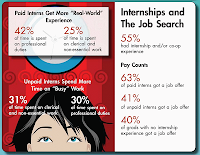 They did less busy work and 63% got at least one job offer, compared to 41% of unpaid interns. The Chronicle/Marketplace survey was conducted by Maguire Associates, but I could not find a report of it on their Web site. I would like to see the actual survey questions and analysis, but this article is worth reading. You should also listen to or read the transcript of the Marketplace podcast (2m 46s) on the study. College students or even high school students planning their college career should crawl around the NACE Web site. There is a lot of useful information there, including a salary calculator for many different jobs in many different locations, based on your background. Actually, the NACE calculator is hosted on the Web site of their partner Jobsearchintelligece.com. JSI maintains a database with salary data for up to 1,000 occupations in 560 regions of the U. S. - with a minimum of 25 respondents for each occupation in each region to ensure statistical significance. You can easily query the database to find, for example, starting salaries for specific full time jobs given specific majors along with salaries for those same jobs ten years after graduation. 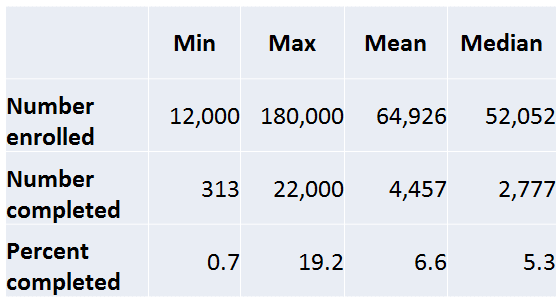 I decided to goof around with an example, and searched for data on modeling jobs. I said I was a recent grad with a GPA between 3.5 and 3.9 who had gone to CSUDH and majored in language and literature. I learned that there are 60 persons employed as models in the Los Angeles area, and starting, median and top salaries are $27,120, $43,810 and $72,290. 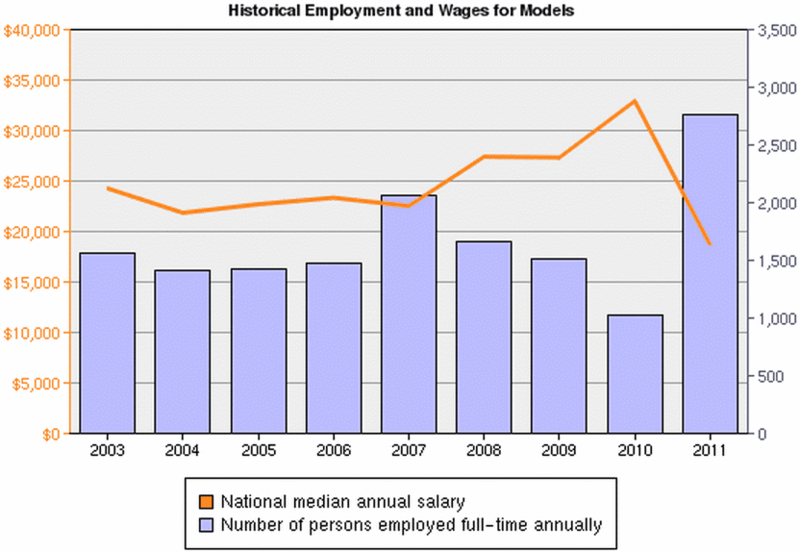 Based upon the background I provided, they estimated my starting salary at $38,900, but after looking at their overall employment picture for models, shown here, I decided to look for a different career. Remember that college is about a lot more than hoped-for jobs and salary. The best thing that can happen at college is not finding a major that leads to job offers with good starting salaries, it is finding something you are passionate about. That is way more important -- put your energy there.